Our product range includes a wide range of pvc plastic welding machine and pvc pu fabric welding machine. 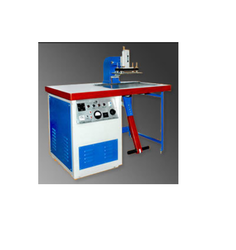 We are Manufacturer of PVC Plastic welding machine. This machine is our Popular model NVP 2000T 2 k.w Table Type for small and Medium type job welding, with Anti-flash, overload, Counter etc. Easy to Operate, Toggle press. 2 Die Holder plate for Small die and big dies. Sumica Tabletop, easier to move material etc. We are leading supplier ofPVC PU Fabric Welding Machine. Client can avail this item from us at a reasonable rate. Looking for PVC Welding Machine ?